CRYPTO Bear Pullback Confirmed By ETHsteemCreated with Sketch. 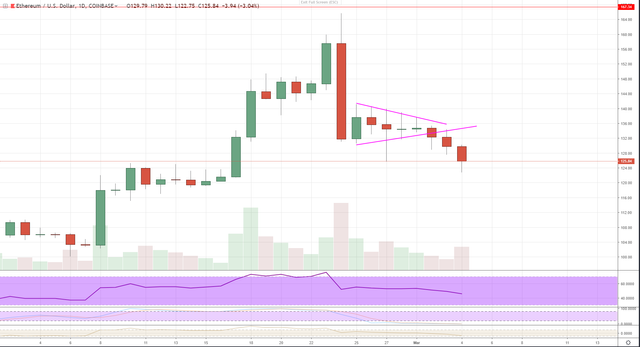 I was eyeing the crypto markets closely lately, and the repetitive break from consolidation for ETh is what especially confirms it for the markets. We saw overbought RSI's on the daily charts which had a huge bear pullback and long consolidation. The longer that consolidation lasted, the more it grew to be in the Bears' favor. At this point, I'm really expecting a continuation of the pullback and seeing this overall bear market continue it's downward pressure. I'm really thinking BTC will hit or break below $3,000. In the short term, 4-hr charts are definitely all oversold, so a bounce here is likely to continue for the short-time being. Hope you all had a great weekend! Make sure your risk tolerances are set. You made more than 15000 comments. Your next target is to reach 16000 comments.